The Findest Kind is a high class fantasy Inn and Tavern that can be placed anywhere in your game world as appropriate. It can be a waypoint with a few subplots and plot hooks of it’s own. Or it can be a major part of larger plot arc. 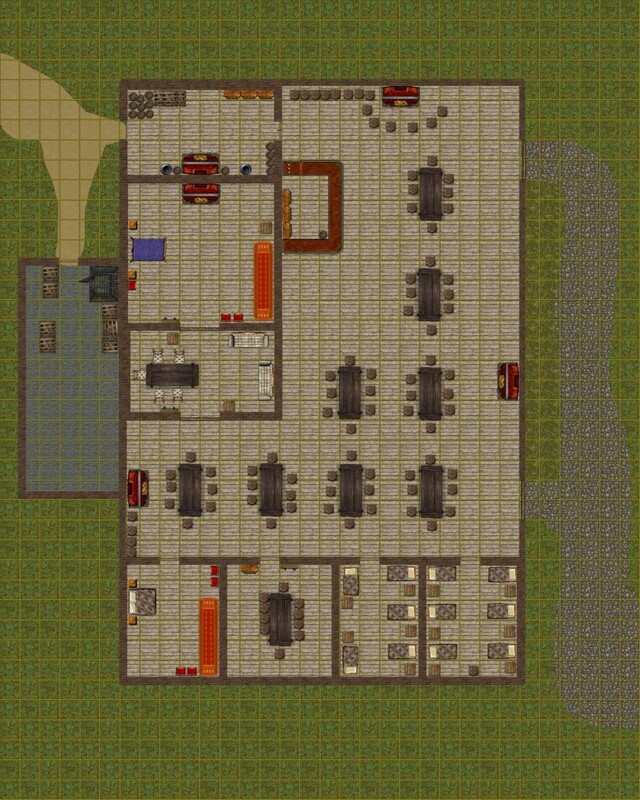 The Finest Kind Inn should sit near a large trade route, noble quarter if in a city, or any other location where it would cater to Nobles and rich Merchants. It is an well appointed single story inn with seven rooms. Two of the rooms are private lodging, one is a private dining room and the other two are communal rooms suitable for guards and servants. There is one huge communal room with many tables, and a large kitchen. A large shed out back holds supplies. The Inn is well built and well appointed. Outside of the common area and communal sleeping quarters furniture is well made and fashionable. In the common area, furniture is also well made, but is more utilitarian and serviceable. All beds are very comfortable stuffed mattresses. Hardwood floors are highly polished, and windows have real glass (or a fantasy equivalent) in them. The inn should obviously be meant to cater towards those with money. The Finest Kind is owned by Thaddeus Eldim, proprietor and bartender. Unbeknownst to all but a handful of people, Thaddeus was at one time better known as the “Death’s Heart” highwayman. He operated successfully for just over a year before his “big score” – the Militia Payroll. After that he moved several hundred miles south and purchased the Finest Kind inn from it’s previous owner. Since then he has been doing a brisk business and is looking forwards to a long comfortable retirement at his inn. Unfortunately Thaddeus’ secret is not as unknown as he’d wish. Lady Lythe Serpenthelm has recently contacted him through an intermediary and threatened to tell his story to the commander of the militia who’s payroll he borrowed. To mitigate that little problem, and to have the evidence thrown away, all he has to do is help a couple men secretly remove her beloved nephew from his inn when he visits. The beloved nephew in question is the 16 year old son of Duke Orster Silverkin, Nobran Silverkin. Lady Lythe’s son, Ecius Serpenthhelm is second in line for the Duke’s title after Nobran. She wishes to remove that little problem as the Duke’s health has been failing lately. The plan is for Thaddeus to install a secret door between his outdoor shed and the best room in the inn. An associate of Lady Lythe will be on hand to make sure the work is done correctly. When Nobran next visits the inn, Thaddeus is to put him up in that room and signal Lady Lythe. Nobran is to be subdued and removed from the inn, and unknown to himself, Thaddeus is to be killed and the inn burned down to remove any evidence. Player Characters have several chances to foil, or help this plot. They can see how nervous Thaddeus is or notice a shadowy figure around. The night of the kidnapping, they can hear Nobran’s cries for help, or later on come across him and his captors. They could investigate an unusual amount of building materials being taken to the inn, but no external signs of construction. Or the PCs could be hired by Lady Lythe Serpenthelm to carry out the deed. Another option is that the Duke knows of the plot and has hired the PCs to play along to gather evidence. In addition to the above plot, several rumors can be heard among the patrons of the inn. Submitted to the RPG Blog Alliance’s November 2013 Blog Carnival – hosted by Nearly Enough Dice. Looks awesome! I especially like the detail in the menu, and the inclusion of rumors could lead to some interesting plot twists. A great contribution to the RPG Blog Carnival!